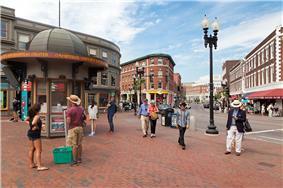 Harvard Square is near the center of Cambridge, Massachusetts, United States. It refers to both the triangular plaza at the intersection of Massachusetts Avenue, Brattle Street, and John F. Kennedy Street; as well as the business district and Harvard University surrounding that intersection. It is the historic center of Cambridge. Adjacent to Harvard Yard, the historic heart of Harvard University, the Square (as it is sometimes called locally) functions as a commercial center for Harvard students, as well as residents of western Cambridge and the inner western and northern suburbs of Boston. These residents use the Harvard station, a major MBTA Red Line subway and bus transportation hub. 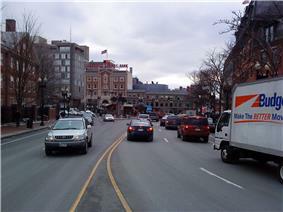 In an extended sense, the name "Harvard Square" can also refer to the entire neighborhood surrounding this intersection for several blocks in each direction. The nearby Cambridge Common has become a park area with a playground, baseball field, and a number of monuments, several relating to the Revolutionary War. The heart of Harvard Square is the junction of Massachusetts Avenue and Brattle Street. Massachusetts Avenue enters from the southeast (a few miles after crossing the Charles River from Boston at MIT), and turns sharply to the north at the intersection, which is dominated by a large pedestrian space incorporating the MBTA subway entrance, an international newsstand, a visitor information kiosk, and a small open-air performance space ("The Pit"). Brattle Street and John F. Kennedy Street merge from the southwest, joining Massachusetts Avenue at "Nini's Corner", where another newsstand is located. The Harvard/MIT Cooperative Society main building forms the western streetwall at the intersection, along with a bank and some retail shops. The walled enclosure of Harvard Yard is adjacent, with Harvard University, Harvard Extension School, Harvard Art Museums, Semitic Museum, Peabody Museum of Archaeology and Ethnology, and Museum of Natural History just short walks away. Other institutions in the general neighborhood include the Cambridge Public Library, Lesley College, the Longy School of Music, the Episcopal Divinity School, the Cambridge Rindge and Latin School, American Repertory Theater, the Cooper-Frost-Austin House, the Hooper-Lee-Nichols House, and the Longfellow House–Washington's Headquarters National Historic Site. The high pedestrian traffic makes Harvard Square a gathering place for street musicians and buskers, who must obtain a permit from the Cambridge Arts Council. Singer-songwriter Tracy Chapman, who attended nearby Tufts University, is known to have played here during her college years. Amanda Palmer, of The Dresden Dolls, regularly performed here as a "living statue". :145 A small bronze statue of "Doo Doo" (a puppet created by Igor Fokin) sits at the corner of Brattle and Eliot streets, in honor of Fokin and all the street performers. 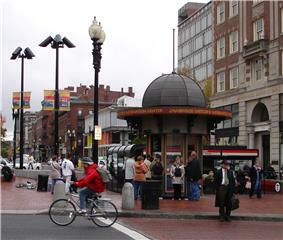 Until 1984, the Harvard Square stop was the northern terminus of the Red Line, and it still functions as a major transfer station between subway, bus, and trackless trolley. Automobile traffic can be heavy, and parking is difficult. Most of the bus lines serving the area from the north and west run through a tunnel adjacent to the subway tunnel. Originally built for streetcars (which last ran in 1958) and still used by trackless trolleys as well as ordinary buses, the tunnel lessens bus traffic in central Harvard Square, and lets buses cross the Square without encountering automobile traffic. The tunnel also allows safer and covered access between the subway and the buses. 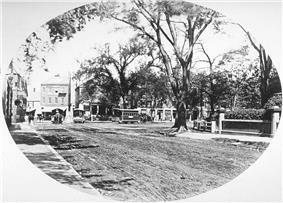 Although today a commercial center, the Square had famous residents in earlier periods, including the colonial poet Anne Bradstreet. Discussions of how the Square has changed in recent years usually center on the gentrification of the Harvard Square neighborhood and Cambridge in general. The Square also used to be a neighborhood shopping center, including a grocery store (Sages) and a Woolworth's five and ten. 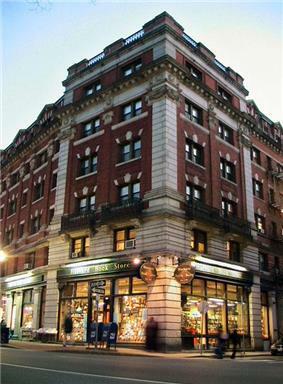 Although a hardware store (Dickson Hardware at 26 Brattle Street) survives amid chain drug stores and bank branches, the Square is mainly a regional rather than neighborhood shopping destination, serving students and commuters. 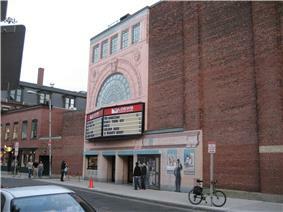 In 1981 and 1987 the Harvard Square Theater was converted into a multiplex cinema; it later became part of the Loews Cineplex Entertainment chain and then closed on July 8, 2012. During the late 1990s, some locally run businesses with long-time shopfronts on the Square—including the unusual Tasty Diner, a tiny sandwich shop open long hours, and the Wursthaus, a German restaurant with an extensive beer menu—closed to make way for national chains. Elsie's Lunch, a long-popular deli, has also closed; what remained of its small corner storefront space facing Lowell House on Mount Auburn Street is now occupied by an ATM. Another long-time restaurant, the 64-year-old Leo's Diner, closed in December 2013 when the landlord of the property terminated their lease. The owners are hoping to reopen in a new location. The student co-op, the Harvard/MIT Cooperative Society ("The Coop", founded in 1882) is now managed by Barnes & Noble, though it is still overseen by a board consisting of Harvard and MIT students and staff. Schoenhof's Foreign Books is owned by the French Éditions Gallimard. Major bookstores Paperback Booksmith, Reading International, and Barilari Books had closed by the end of the 1990s. WordsWorth Books at 30 Brattle Street closed in 2004, after 29 years as a fixture in the Square. In the same year, the famous Grolier Poetry Bookshop announced that it would be sold (although it survived under new management). Globe Corner Bookstore converted to an exclusively online business, serving its last walk-in customer on July 4, 2011. Following national trends, the former Harvard Trust Company has been absorbed into the national Bank of America through a series of mergers. The iconic Out of Town News is owned by the UK-based Hudson Group. Still, several establishments remain as longstanding, locally-run businesses with unique styles. Examples include Leavitt & Pierce tobacconists (est. 1883), Laflamme Barber Shop (est. 1898), Harvard Book Store (est. 1932), Cardullo's Gourmet Shoppe (est. 1950), Charlie's Kitchen (est. 1951), the Brattle Theater (est. 1953), the Hong Kong Chinese restaurant (est. 1954), Club Passim (est. 1958), Café Pamplona (est. 1959), Mrs. Bartley's Burger Cottage (est. 1960), Dickson Brothers Hardware (est. 1961), Algiers Coffee House (est. 1970), and Grendel's Den (est. 1971). Raven Used Books arrived in 2005, helping to preserve Harvard Square's reputation as a center for used and new book browsing and sales. A 2012 proposal suggested major changes to the pedestrian island in the heart of Harvard Square, including possible removal of the landmark Out of Town News kiosk. Reaction to the proposal was mixed, and no changes have been approved as of April 2015. At the center of the Square is the old Harvard Square Subway Kiosk, now a newsstand, Out of Town News, stocking newspapers and magazines from around the world. A video of it appears in transitional clips used on CNN. A public motion art installation, Lumen Eclipse, has been introduced at the Tourist Information Booth showing monthly exhibitions of local, national and international artists. 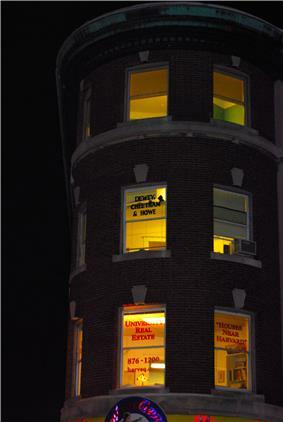 The office of NPR's Car Talk radio show faces the square, with a stencil in the window that reads "Dewey, Cheetham & Howe," the fictional law firm often referenced on the show. The popular show has referenced this by asking its viewers to send in answers to the "Puzzler" to "Puzzler Tower, Car Talk Plaza, Harvard Square, Cambridge (our fair city), MA 02138". In the southwest area of the Square neighborhood, on Mount Auburn St, stands the Igor Fokin Memorial. This memorial, created by sculptor Konstantin Simun, pays tribute not only to the late "beloved puppeteer," but to all street performers that are an integral part of the square, especially during summer months. A number of other public squares dot the surrounding streets, notably Brattle Square and Winthrop Square,[note 1] with a wide variety of street performers throughout the year. Brattle Street itself is home to the Brattle Theater (a non-profit arthouse theater) and the American Repertory Theater. The John F. Kennedy Memorial Park, one block further down JFK Street, is on the bank of the Charles River. Cambridge Common is two blocks north. The Square often attracts activists for unconventional political factions and has its share of panhandlers. Although Tom Magliozzi has derided it as "the bum capital of the world", it's also very likely one of the world's best places to people-watch, having many benches, terraces, and sidewalk restaurants and cafes dedicated for that purpose, and an affluent, ambient shopping population to sustain most anyone's interest. "The Garage" is a small, multi-story shopping mall, named thus because it was formerly a parking garage. The original car ramp has been preserved, and is a central feature of this adaptive reuse project. One of the main attractions in The Garage is a Newbury Comics store. The 1969 film Goodbye, Columbus takes place in Harvard Square near the film's conclusion, after the Richard Benjamin character learns that his girlfriend, Brenda Potimkin (played by Katharine Ross), an undergraduate at Radcliffe College, had left her diaphragm in the top drawer of her bureau at home for her mother to discover. The 1970 film Love Story, by the late Harvard University alumnus and Yale University professor of classics Erich Segal, takes place almost entirely in and around Harvard Square during its first two-thirds, while Harvard undergraduates Oliver Barrett and Jenny Cavalieri meet; finish college; get married; and Oliver goes to Harvard Law School while Jenny teaches school, living in a second-story walk-up in what looks like Watertown. The film continues to be screened annually to incoming freshmen at Harvard College during orientation week. The 1973 film The Paper Chase, set at Harvard Law School, features Harvard Square landmarks of its era, including the old Out of Town Newsstand, the old MBTA Harvard station kiosk with its "8 Minutes to Park Street" sign, and the now-defunct Kupersmith's Florists. The 1977 film Between the Lines features similar Harvard Square footage as well as aerial footage of the Back Bay. The 1994 film With Honors has a scene filmed in Harvard Square in which the Out of Town Newsstand is featured. In the scene, Monty approaches Simon as he (Simon) is attempting to sell newspapers he took out of a vending machine. Various parts of the 1997 film Good Will Hunting were filmed in and around Harvard Square, most notably at the former Tasty Sandwich Shop and the outdoor seating area of the square's largest Au Bon Pain café. The 2005 documentary film Touching History; Harvard Square, the Bank, and The Tasty Diner chronicles the changing face of the Square, as a small diner (The Tasty) closes its doors to make way for a large retail space. Ben Affleck shot portions of his film The Town (2010) in Grendel's Den on Winthrop Street, locally famous in the 1970s for its chocolate fondue. The 2010 film The Social Network, about the Harvard student origins of Facebook, featured aerial footage of the area near Holyoke Center. ^ Brattle Square, Harvard Square, and Winthrop Square are at the three corners of the triangular block formed by Brattle Street, JFK Street, and Mt. Auburn Street – Brattle Square is at the triangular intersection of Brattle and Mt. Auburn, while Winthrop Square is at the southwest corner of Mt. Auburn and JFK. ^ a b c Lotman, Mo (2009). 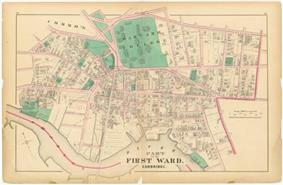 Harvard Square: An Illustrated History Since 1950. New York: Stewart, Tabori & Chang. ^ Show, Jim. "The Igor Fokin Memorial Sculpture Project". Igor Fokin 1960-1996. Retrieved 24 June 2013. ^ "AMC to close theater in Harvard Square in July". Boston.com. Retrieved 2012-12-31. ^ Baldassari, Erin. "After 32 years, Leo’s Place closes". Wicked Local News. Retrieved 13 March 2014. ^ "Ohio-state.edu". Omega.cohums.ohio-state.edu. Retrieved 2011-03-12. ^ ""WordsWorth to Close on Saturday", "Book Selling This Week"". News.bookweb.org. Retrieved 2011-03-12. ^ Flynn, Kerry M. (May 24, 2012). "Harvard Square Reacts to Dramatic Renovation Proposal". The Harvard Crimson (The Harvard Crimson, Inc.). Retrieved 2015-04-13. ^ "Igor Fokin Memorial". Igorfokin.com. 2001-09-22. Retrieved 2011-03-12. ^ "Createspace.com". Createspace.com. 2011-03-08. Retrieved 2011-03-12. ^ Fennimore, Jillian. "Movie shoot at Grendel's Den". Wickedlocal.com. Retrieved 2011-03-12. Lotman, Mo (2009). Harvard Square: An Illustrated History Since 1950. Stewart, Tabori & Chang. p. 240.